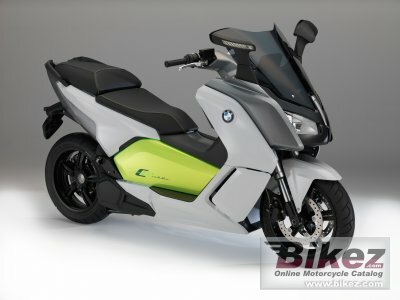 2015 BMW C Evolution. Picture credits - BMW. Submit more pictures. Visions begin in the mind, hands bring them to life. The concept vehicle �Concept e� bore all the distinctive marks of today�s serial production C evolution in terms of technology and design. This electrically powered maxi scooter sets the benchmark for dynamic e-mobility on two wheels. Comments: 8 kWh lithium-ion battery. (3 modules, twelve 60 Ah cells per module. Range 62 miles. Windscreen. Ask questions Join the 15 BMW C Evolution discussion group or the general BMW discussion group. Bikez.com has a discussion group for every motorcycle. Here you may find answers to common questions about the model. If you do not find what you are looking for, you can ask questions. Try out the 2015 BMW C Evolution discussion forum. You can sign up for e-mail notifications when other users answer you. If you have information about any technical issue related to this motorcycle, please leave a comment for other riders.